Vietnamese Cuisine is known around the world as being light, healthy and of course delicious. University Hospitality Seminars have created an opportunity for university chefs to learn more about this cuisine. David McKown, Director of University Hospitality Seminars commented: ‘this is a very relevant seminar since according to figures from the British Council, the number of Vietnamese people studying in the UK is growing by over 20% year on year’. With influences from East and South-East Asia, as well as Europe, Vietnam has a truly international food culture. The seminar will showcase dishes that can be recreated within university kitchens that will delight students, staff and conference guests. Wyn Ma and Cyrus Todiwala OBE DL will work together to deliver this exciting seminar. Cyrus commented: “Wyn Ma is my favourite Vietnamese Chef, he produces the best Vietnamese Food in London”. David McKown, Director of University Hospitality Seminars added: ‘Wyn will demonstrate a range of both meat and vegan dishes that can be applied back at your university, and in addition, a number of low cost dishes will be featured that that can be sold in student dining rooms for less than £5 and still achieve a GP of more than 70%’. Wyn Ma came from Vietnam to the UK in 1980. 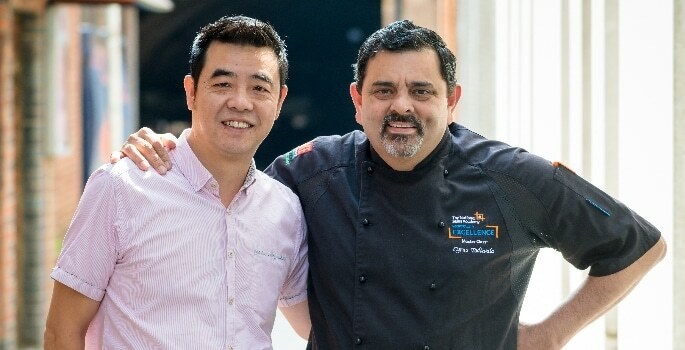 He followed his passion for food and opened his own restaurant – Green Papaya – in London in 2000. Recommended by Lonely Planet, Harden’s and Vogue, Wyn has recently opened his second critically acclaimed restaurant in the city. Cyrus Todiwala OBE DL, is chef proprietor of Café Spice Namasté and a celebrated chef. He trained at the Taj Hotels Resorts and Palaces in India and rose to become Executive Chef for eleven restaurants. He was awarded an MBE in 2000 and an OBE in 2009. Cyrus has cooked for royalty and presidents across the Globe. The seminar takes place on Thursday 15 March at Café Spice Namaste in London and further details are available at www.universityhospitality.co.uk.